OLM to PST Converter is brilliant application to convert Outlook 2011 for Mac OLM file data in Windows Outlook PST file. The tool will export complete mailbox data like Emails, contacts, calendars and journals from OLM file to PST/EML/MSG format. The demo version to allow users export first 25 emails. Outlook 2011 for Mac is an email client that allows users to communicate with each other on Mac platform; it saves all data in OLM file format. But sometimes being a sensitive file OLM data gets corrupted due to reasons like unexpected shut down, improper exit of Outlook, virus/malware attacks and hard drive corruption etc. Why Import OLM To PST file is Required? Import OLM into Outlook PST is required when users are switching from Outlook 2011 for Mac to MS Outlook for Windows. To carry out to transfer Mac data file in Windows Outlook PST file is required that again calls for third party tool. OLM to PST Converter tool is globally accepted by users because it has compatibility to run on all Windows version including 8.1 and below. Users can run this utility on all Windows version Operating System that makes it convenience for user. The tool is integrated with advance algorithms that support latest versions of Outlook 2013. The tool will export OLM data in Unicode PST file that can be used with all latest Outlook versions. 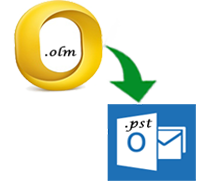 Yes, the tool help to transfer OLM emails attachments in Outlook PST format in its original formats. Tool will extract all email attachments of OLM emails in PST format without any changes or alterations. No, the tool is standalone application that works without installing supported email clients in PC. Users can import resultant EML file in supported email clients once the migrate OLM to EML is done. "Converting MAC OLM files manually is not possible. I had to convert my emails stored in OLM file to EML format. Thanks to OLM Converter that efficiently converts the OLM file to different file formats." "I was switching my system from MAC to Windows system and therefore had to convert the data stored in OLM files to PST format. Software proved to be a useful utility to carry out the conversion process." "I have found the application to be very reliable. I was very worried as half of my OLM Files got corrupted and I could not find a way out to fix them. The easily turned out to be a savior for me."